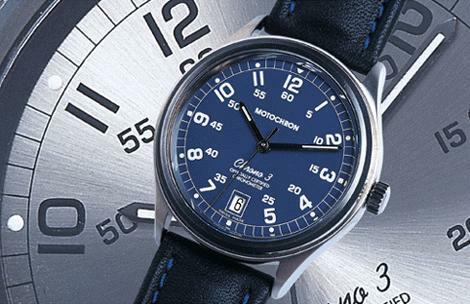 Motochron is a small German firm, started by Dr. Georg Konradsheim in the mid-1980s, that started out by featuring watches with automobile (speedometer) and airplane (airspeed indicator) instrument dials. While they have had a great success, customers were clamoring for a traditional watchface design, hence the “Chrono 3″. The specifications are: Chronometer certified ETA 2824-2 automatic movement, anti-reflective sapphire crystal, and display back. The dial is available in black, blue or silver. Case diameter is 38.5mm.